I was fortunate to get ground and sliced almonds in the store, which saved at least 20-30 minutes. My glaze wasn’t visible at all, but it tasted nice and moist. Yum! Did it taste almondy? Very much so! The taste improved even more after a day or two. And this was the first cake quantity to really fill the bundt pan, and come out the size it ought to be. 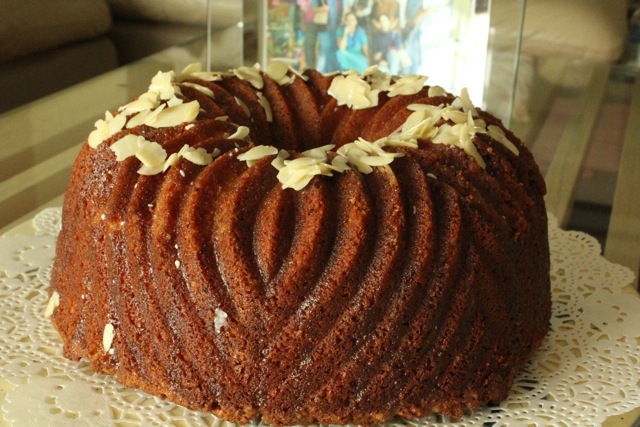 Most of my bundt cakes are at least 20-30% smaller than this one. The slices are, of course, gigantic.